I’m so pleased to share this lovely review by Feathered Quill Book Reviews for My Little Angel. 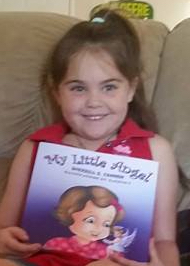 “Award-winning author Sherrill S. Cannon is at it again with her newest book, My Little Angel, telling a delightful story about a little girl and her guardian angel. The star of our adventure, a sweet little girl (we never learn her name), tells the reader about her very special friend, Angela, who just happens to be her guardian angel. Angela sits on the girl’s shoulder and is dressed is a light blue dress with matching shoes, a halo, and white, almost translucent, wings. Angela always wears a big smile, and sparkling light seems to follow her wherever she goes. And she makes sure I’m careful where I put my feet. The story, written in a nice-flowing rhyme, tells a sweet story that also helps impart life lessons (manners, caring for others) to young readers. Like the other books by Sherrill Cannon, this one is illustrated by Kalpart, a company that has a reputation for creating delightful images for books. Again, Kalpart does not disappoint as the drawings are vibrant and fun and are a perfect compliment to the story. At the back of the book the author has included “Special Notes” that ask children to a) hunt and find images of different book covers in the story; b) answer questions about their own safety habits; and c) answer questions about the story. Finally, if you purchase the author’s books from the website sbpra.com/curejm, 50% of the sales will be donated to help find a cure for Juvenile Myositis – a win-win for everybody! Previous PostI got an email update from Sherrill S. Cannon today, could not restrain myself from sharing. Convert your photos into digital, funny, black and white or personal color caricature with Kalpart. We also offer great caricature designing of portrait sketch and ad poster designing at competitive prices. I got an email update from Sherrill S. Cannon today, could not restrain myself from sharing. 7th Award sticker for this lovely children storybook, have a look once.